ALL NATURAL AND ORGANIC INGREDIENTS YOU CAN TRUST: At Oxgord we are committed to the use of the highest quality all natural and organic ingredients. Our pet wash shampoo is certified organic. This commitment not only insures that your pet and your family are only exposed to all natural non­toxic materials, but that your pet's care is attended to with the most effective ingredients available. We believe in total transparency, all our ingredients are clearly marked and 100% accurate and truthful. QUALITY SHAMPOO FOR YOUR DOG, WITHOUT COMPROMISE: Oxgord is proud to offer our 100% vegan and organic Pet Wash Shampoo. Your dog is a loving member of your family, does he or she not deserve the best when it comes to caring for their coat and skin. At Oxgord we have developed an all natural and certified organic shampoo that not only respects the environment as well as nature, but insures that in doing so your pet has the best possible skin care and coat treatment available. It is our belief that responsibly manufactured, vegan­organic products are a way of showing both stewardship to our planet, and loving respect for the animals that so deeply enrich our lives. THE MOST EFFECTIVE ORGANIC PET SHAMPOO FOR YOUR LOYAL COMPANION: Our Pet Wash Shampoo is a premium coat and skin treatment that comes directly to you and your pet without sacrificing vegan and organic principles or quality . Our delicate balance of essential oils form the foundation of a veterinarian recommended coat care regimen. All natural aloe, jojoba and coconut oils relieve painful and itchy skin caused by fleas, dander, and dryness. Oatmeal, Shea Butter, and Natural Rosemary Extract combine to smooth and moisturize even the most brittle, dry coat, leaving your dog's fur clean, smooth, and odor free. Even tangled and matted fur is left detangled and irritant free, for a snuggly softness and a tail wagging happiness. Our all natural formula insures a non­toxic, natural treatment that is safe for both your pet and your family. After all your dog is a part of the family, why not treat them like it. TEAR FREE SOAPLESS FORMULA TURNS BATHTIME INTO PLAYTIME: Our tear free formula is the result of natural oils and extracts that do not irritate or inflame your dog's eyes or nose, ensuring that bath time is a fun and playful experience for you both. (we cannot guarantee a splash­free experience.) 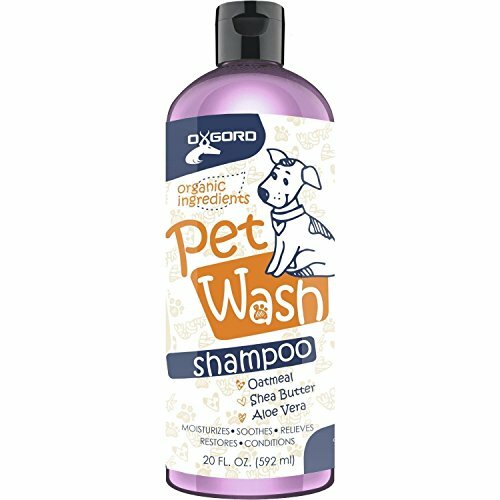 Our pet wash shampoo is easy to apply in a tub or shower. Using warm water simply wet your pet thoroughly insuring a deep, moist coat. Apply Pet Shampoo from head to tail. Gently lather and massage deep into the coat and skin. Repeat as necessary depending on your dog's level of activity and outdoor exposure. A TRUE COMMITMENT TO ALL OF NATURE: Our commitment to cruelty free, vegan and organic goods is something we take seriously. It is our belief that the manufacturing and packaging of our pet wash shampoo should be done in a way that has least possible footprint upon the environment. This is why our packaging is made with recycled materials and is guaranteed paraben. Oxgord stands committed to the ethical treatment of all animals as well as their habitat and welcomes any input or suggestions or comments you have regarding our products and how we might serve you and your pet or pets better. Product Details: ­Oxgord’s 100% All Natural and Organic Pet Wash Shampoo, Specially formulated for the dry, sensitive, skin and coat of your dog. ­All Natural Cleansing and Moisturizing for You and Your Family’s Best Friend. ­ 100% Natural Oils for deep cleansing and moisturizing of your dog’s coat and skin. ­Certified Vegan Organic Ingredients, Non­toxic and safe for your dog and your family. ­All natural aloe, jojoba and coconut oils relieve painful and itchy skin caused by fleas, dander, and dryness. ­Oatmeal, Shea Butter, Rosemary combine to smooth and moisturize even the most brittle coat, leaving your dogs fur clean, smooth and odor free. ­Tearless soap free formula makes for a hassle free painless bath time. ­Brings restored shine and health to your dog’s matted or worn coat. ­Certified Paraben Free, and of course Cruelty Free. ­20 Oz. bottle made with recycled materials. ­Proudly Made in the U.S.A.